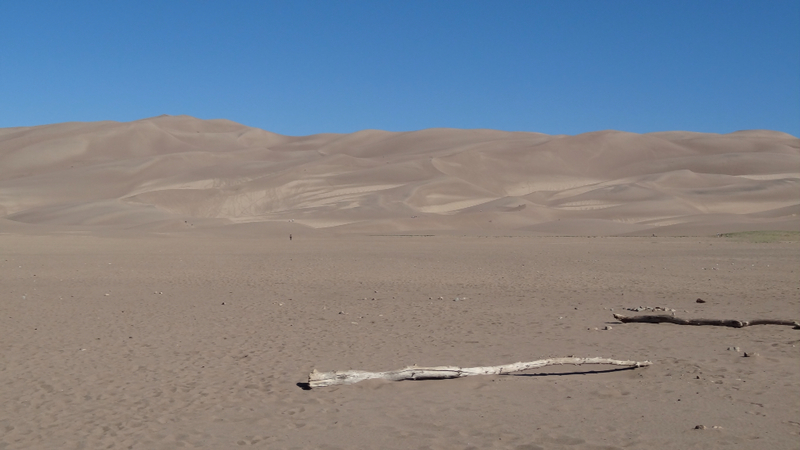 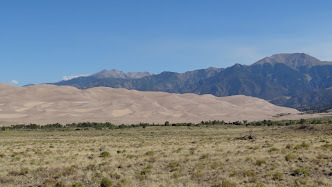 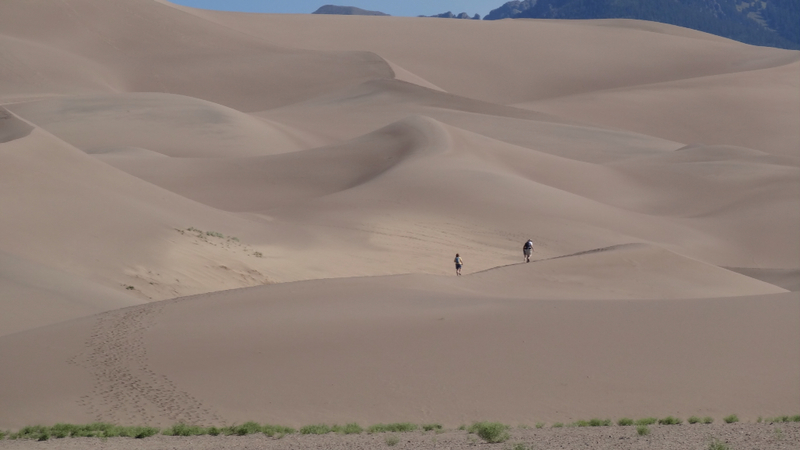 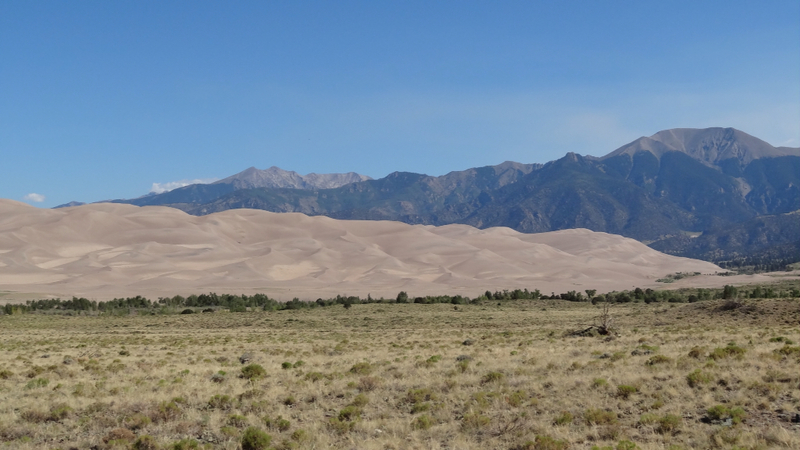 In the Southwestern part of Colorado is a park of massive sand dunes. 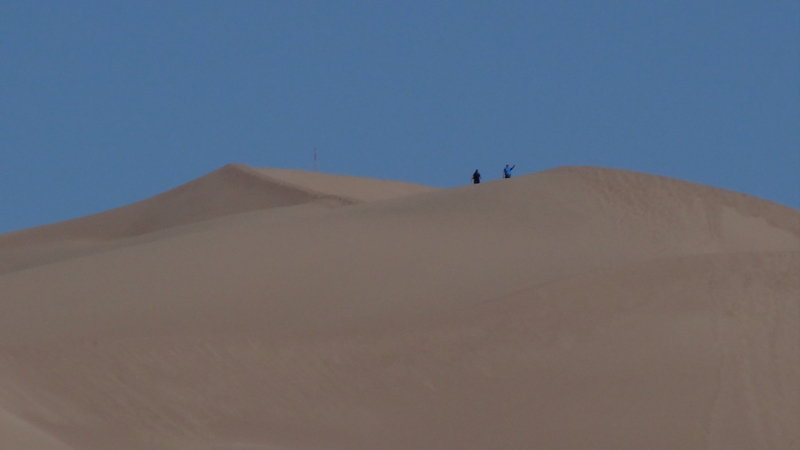 The dunes are settled at the base of the San Christo Mointains. 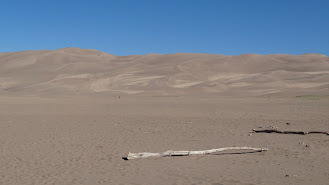 The temperature of the sand can reach 140 degrees in the summer. 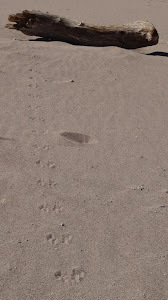 Someone else has been visiting the dunes. 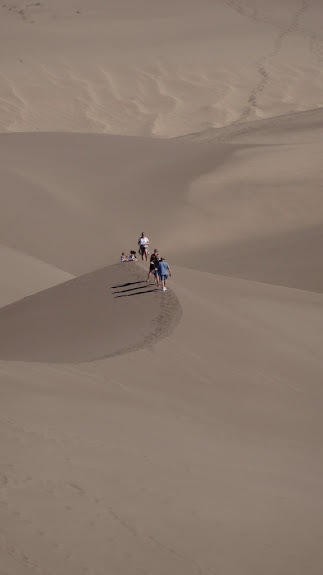 Can you spot the people in this sea of sand? Our seventh national park is Mesa Verde. 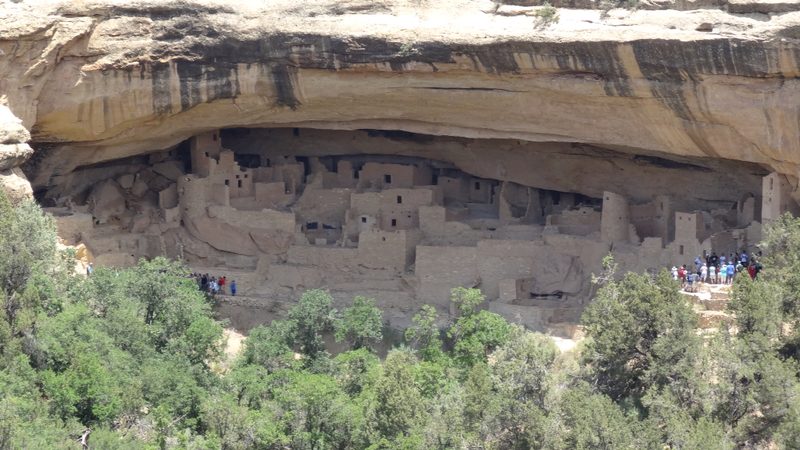 Its a park featuring the cliff dwellings of ancient people. 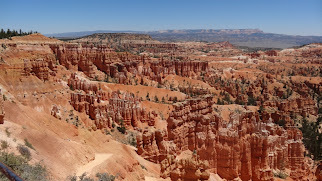 the largest settlement in the park. 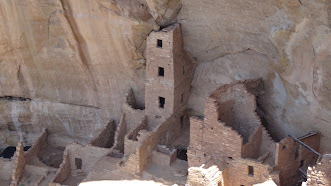 Tower house inside of a deep canyon. 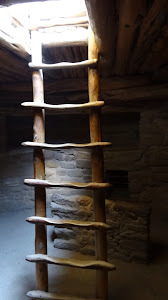 We were able to tour the Spruce Tree house. 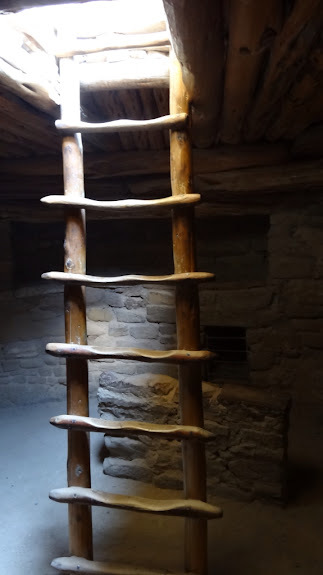 to an underground kiva via ladder. 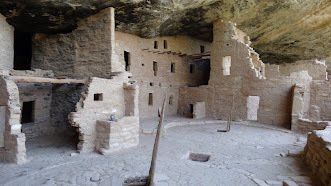 Inside the kiva it is much cooler than the 99 degrees outside. 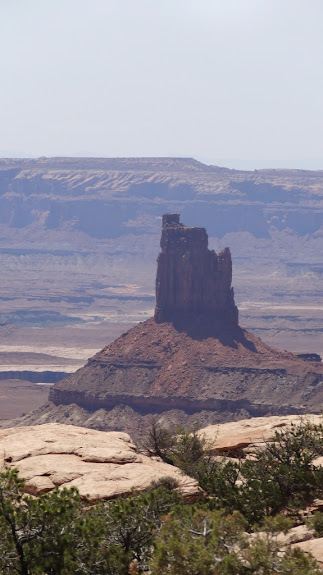 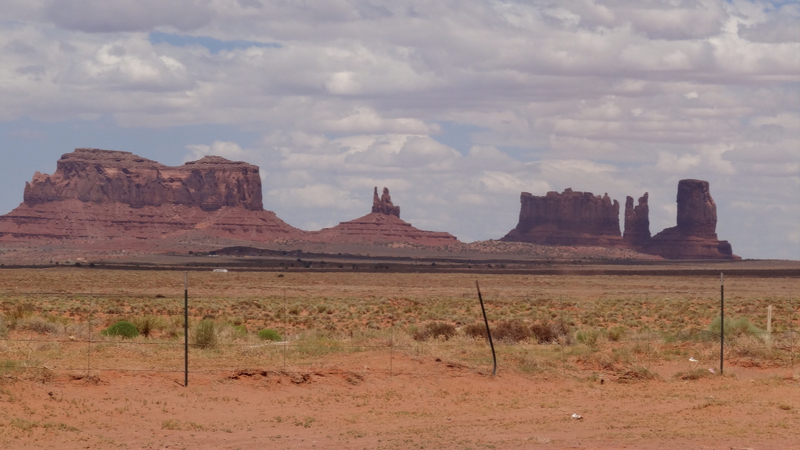 Monument Valley is the site of many old western movies. 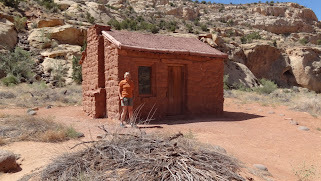 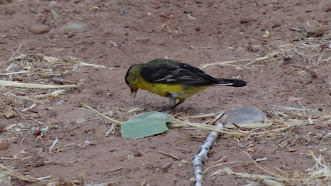 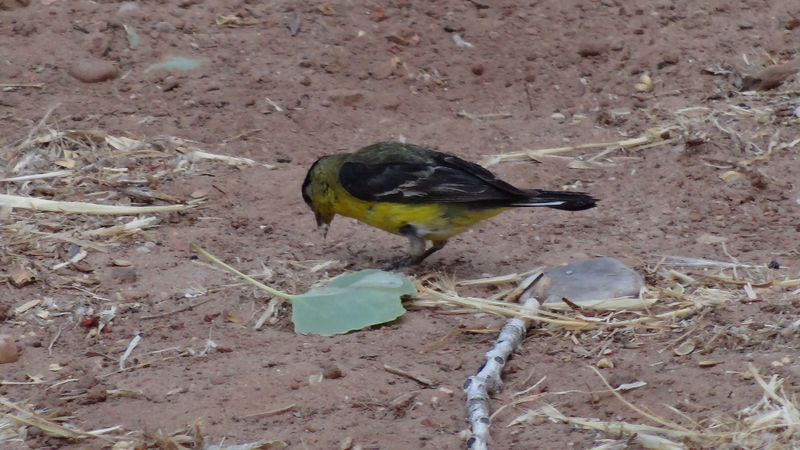 It is located on the Navajo Indian Reservation. 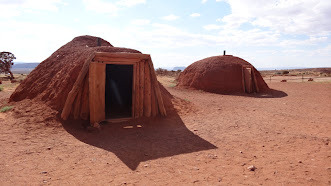 These are traditional Hogan Indian homes. The smaller one is a temporary structure, easily dismantled and moved. 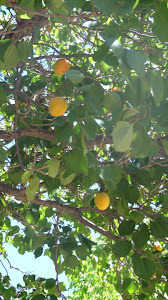 The round one is larger and more permanant. 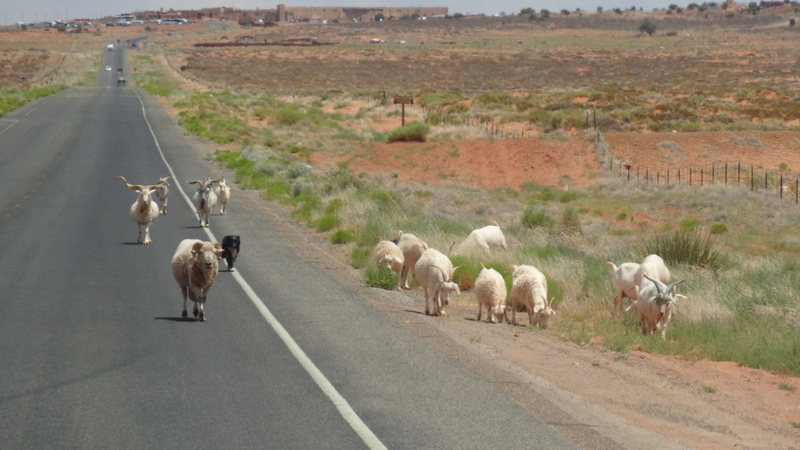 We enjoyed seeing these goats being herded home by two lone dogs. 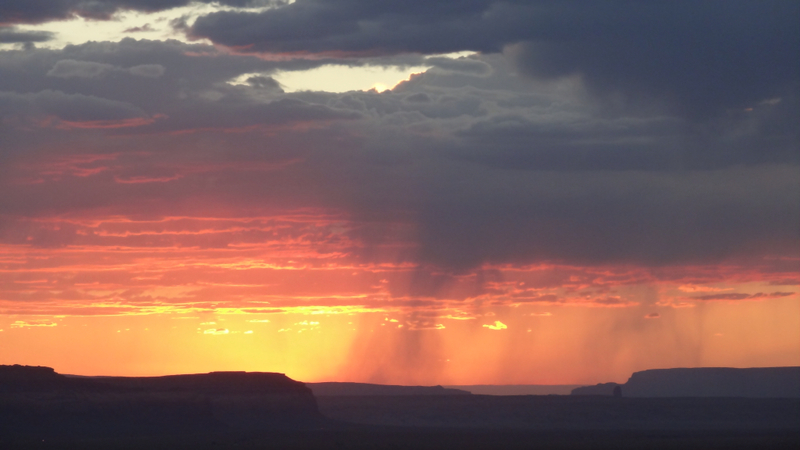 As the sun set, we watched a storm blow across the desert. 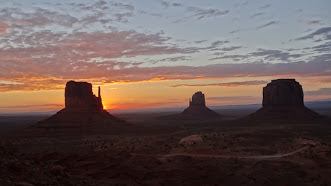 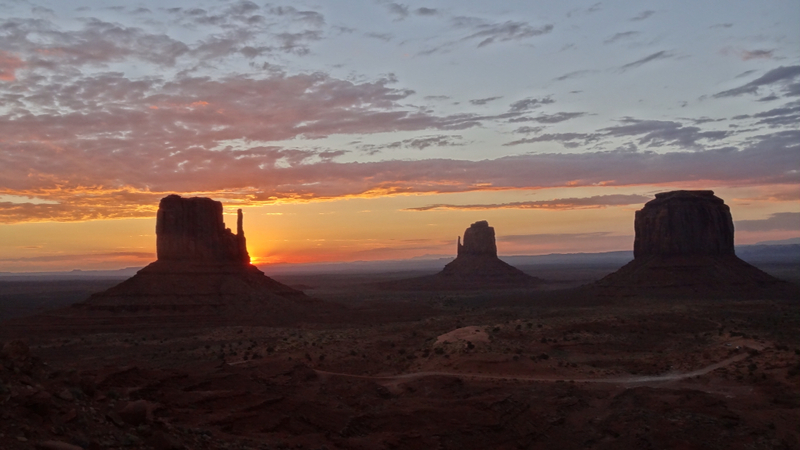 saw a gorgeous sunrise in Monument Valley. 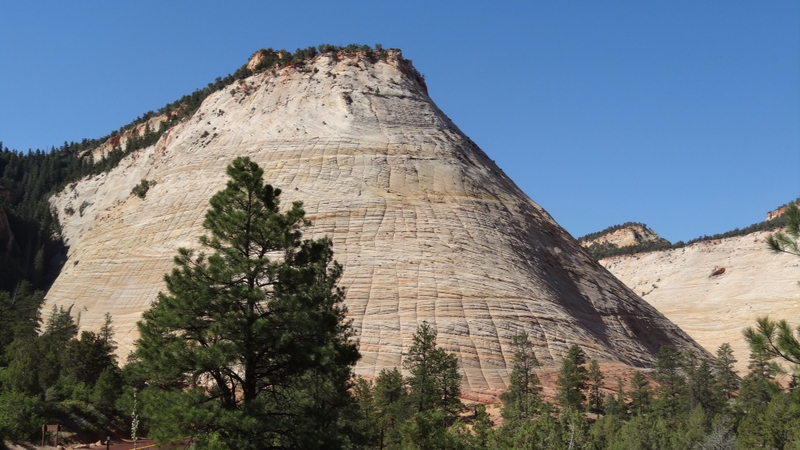 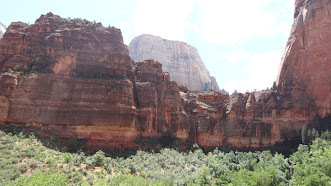 Zion is a park of steep canyon walls. 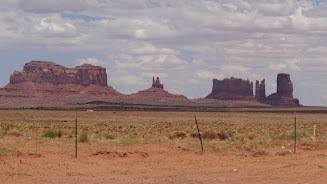 The view coming into the park from the east. 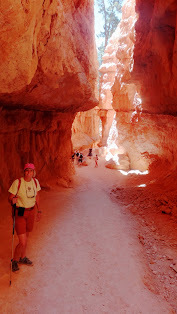 The hike through the Narrows is the popular hike. 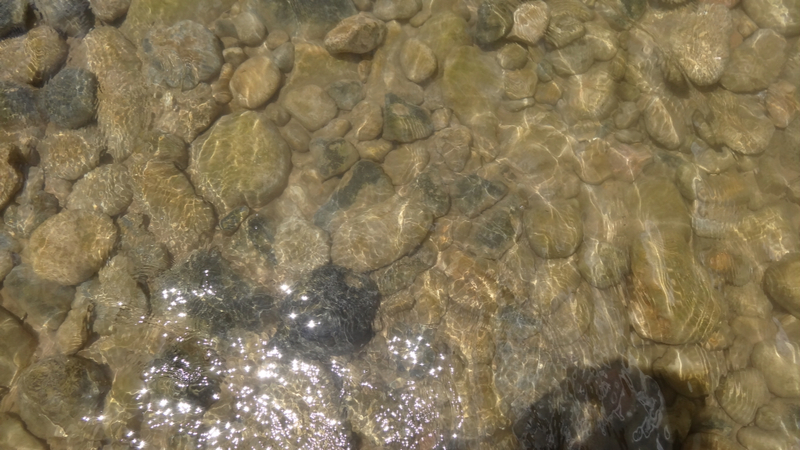 The water is clear and cool on a 101 degree day. 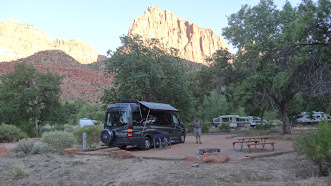 Our campsite in the shadow of the Watchman Peak. 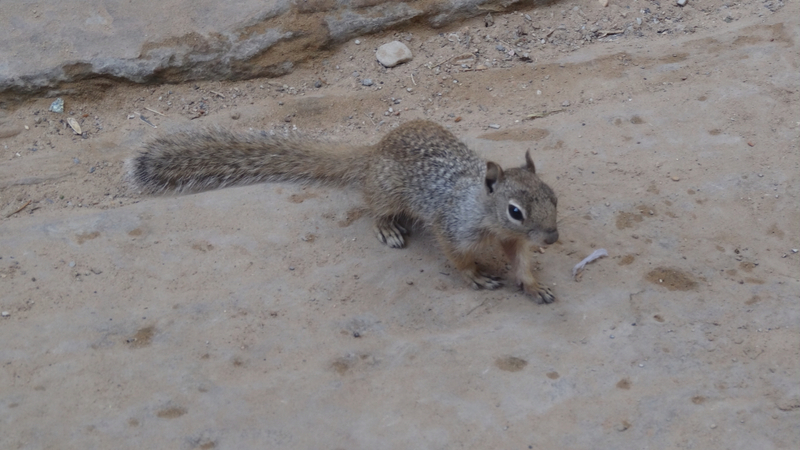 scurrying between your feet & raiding backpacks. 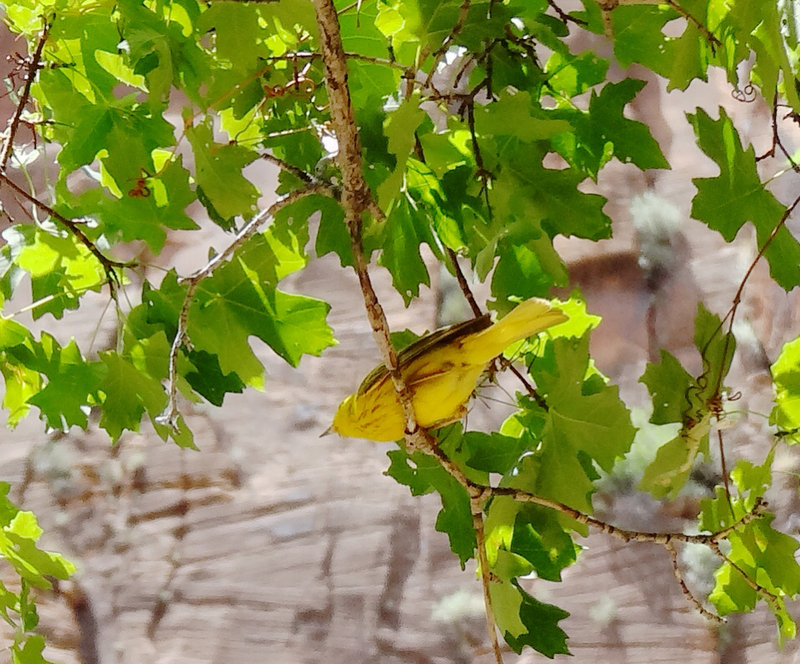 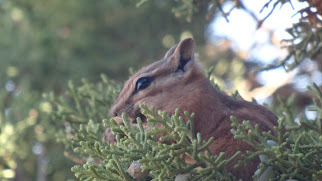 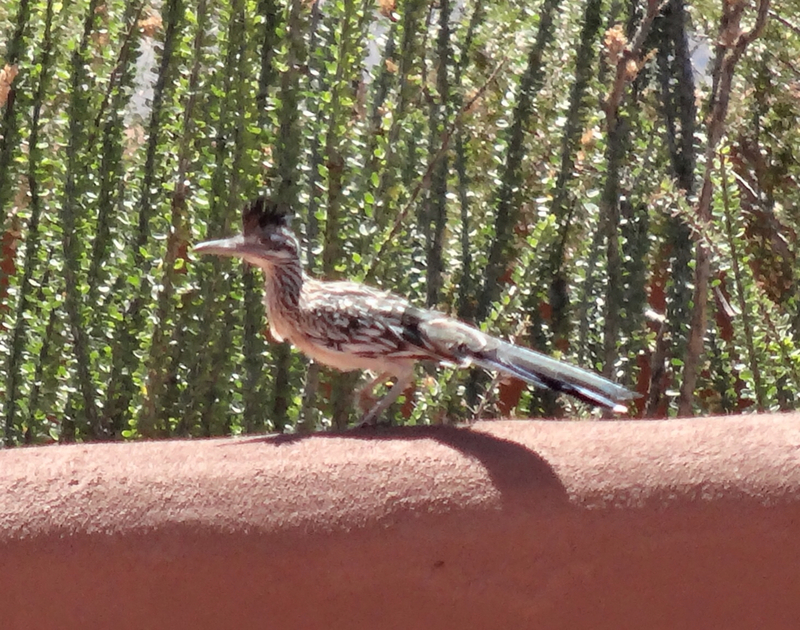 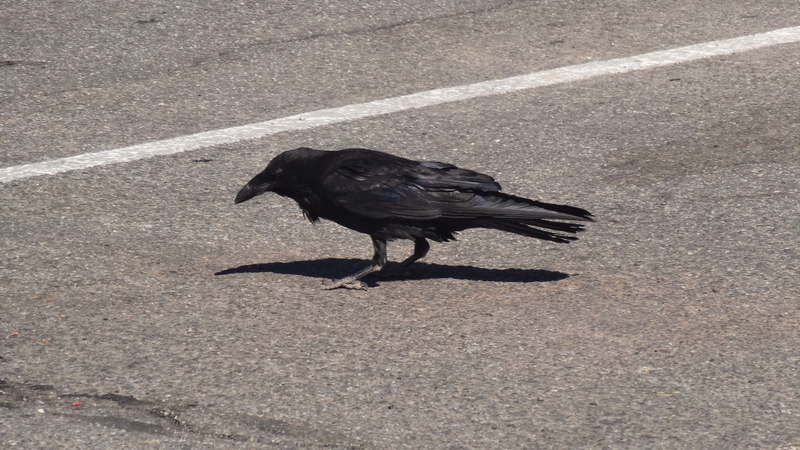 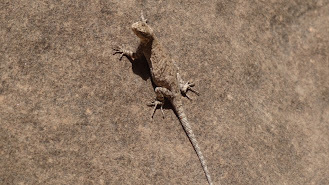 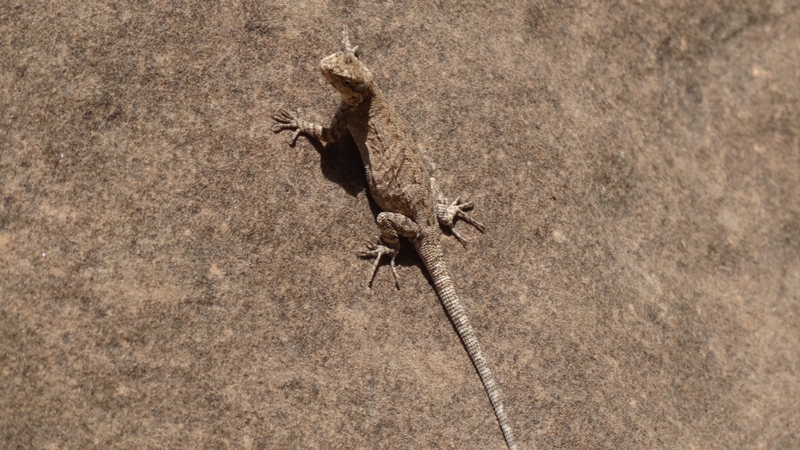 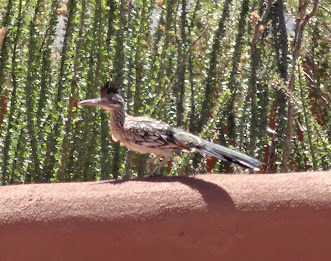 This fellow was clinging to the walls of the Narrows. 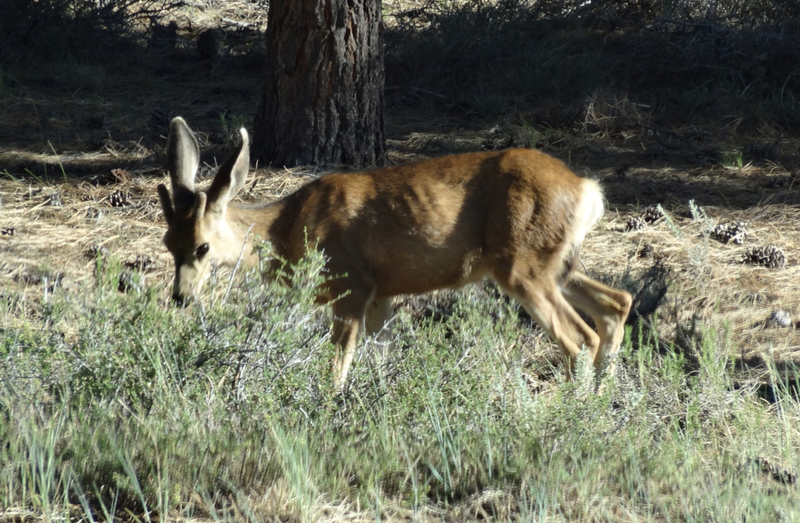 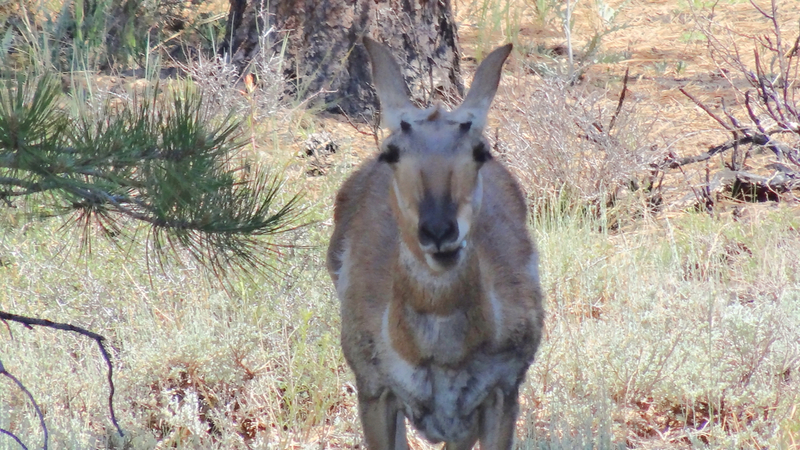 This desert rat shared our campsite with us. Capitol Reef is a little known national park in Utah. Its main feature is the 100 mile long crest of slickrock called the Waterpocket Fold. 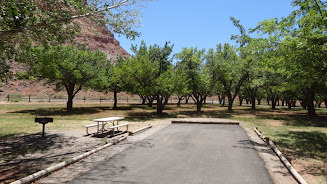 where mormon pioneers settled and planted orchards. Apple, cherry, pear, peach and apricot trees were planted making this an oasis in the desert. 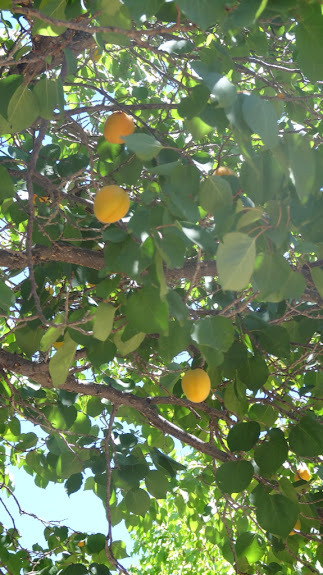 The apricots were almost ripe. and sampled some of the homemade pies. 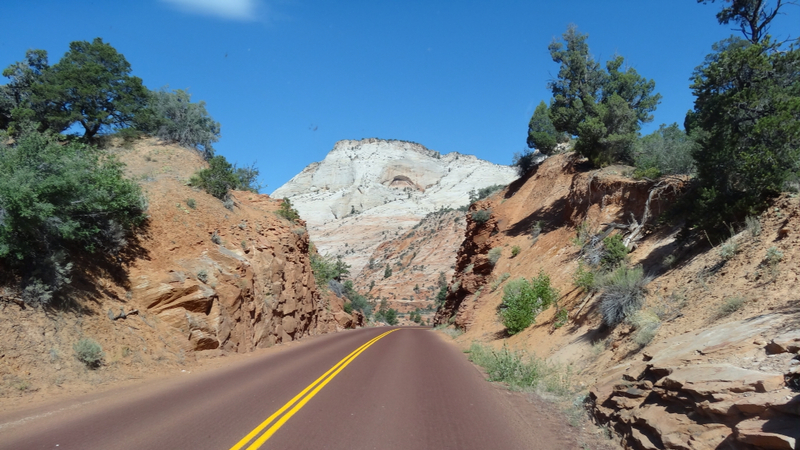 We are continuing our trip through Utah. 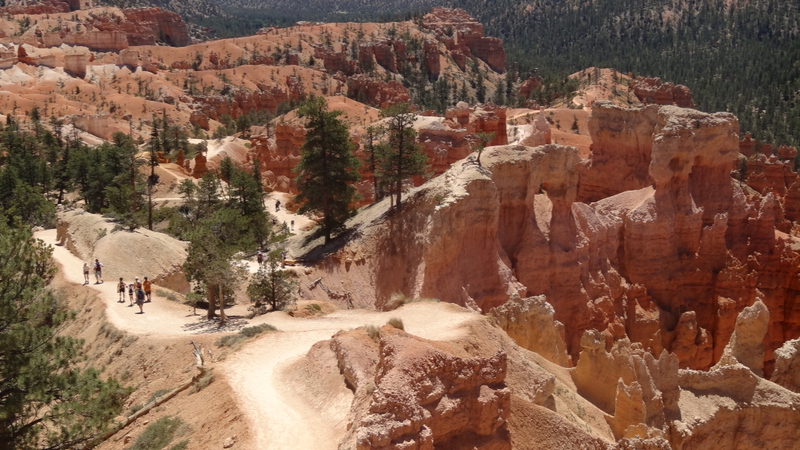 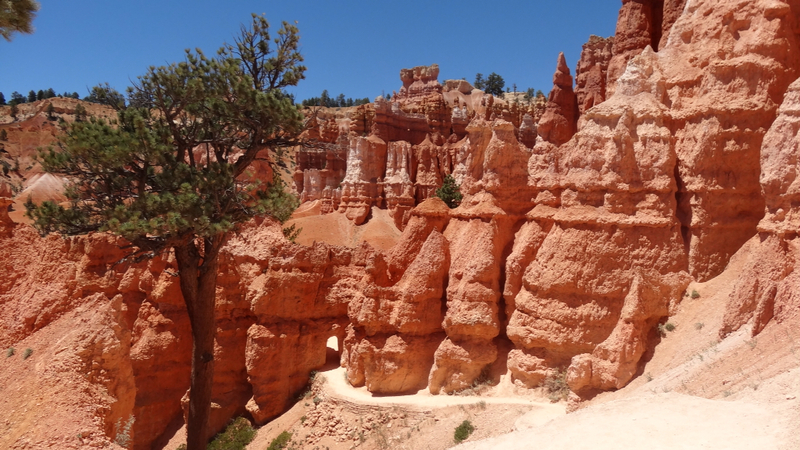 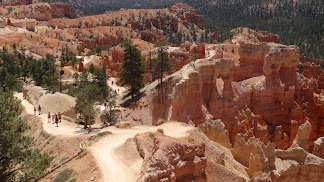 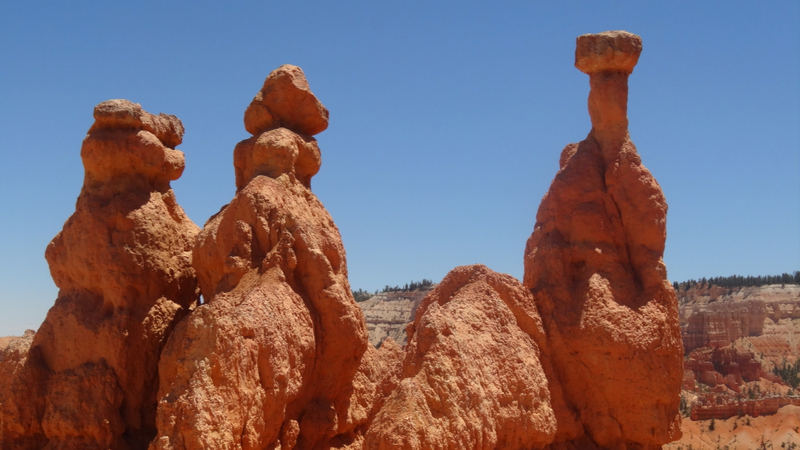 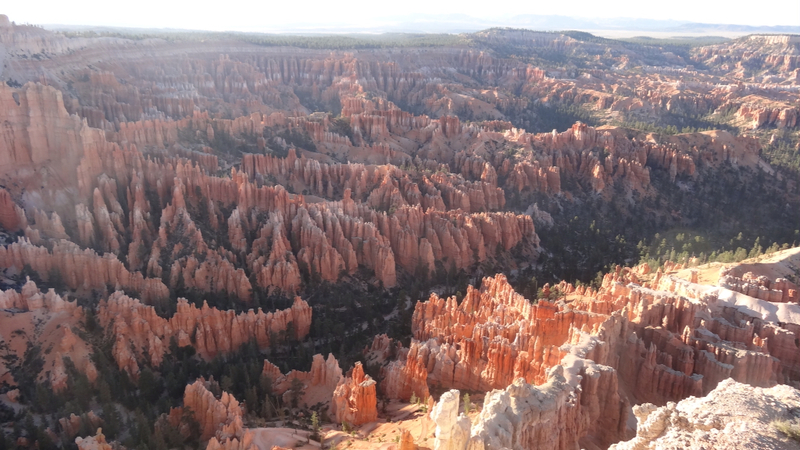 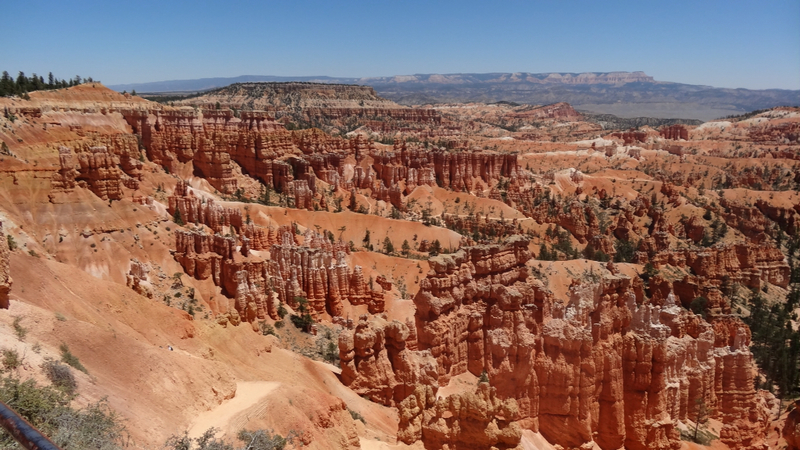 The hoodoos of the canyon. 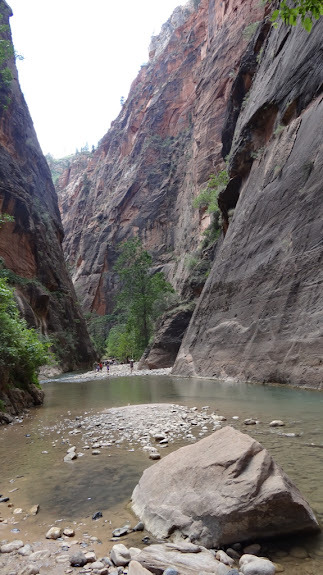 Touted as the best 3 mile hike in the world. 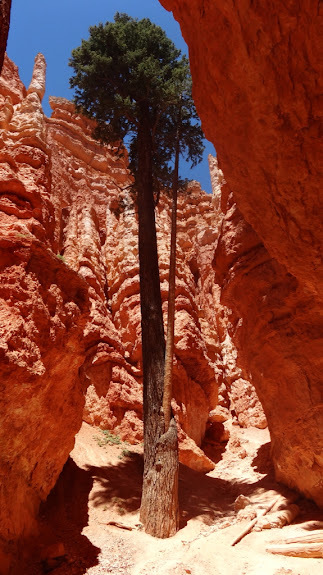 A tree growing up between the hoodoos. 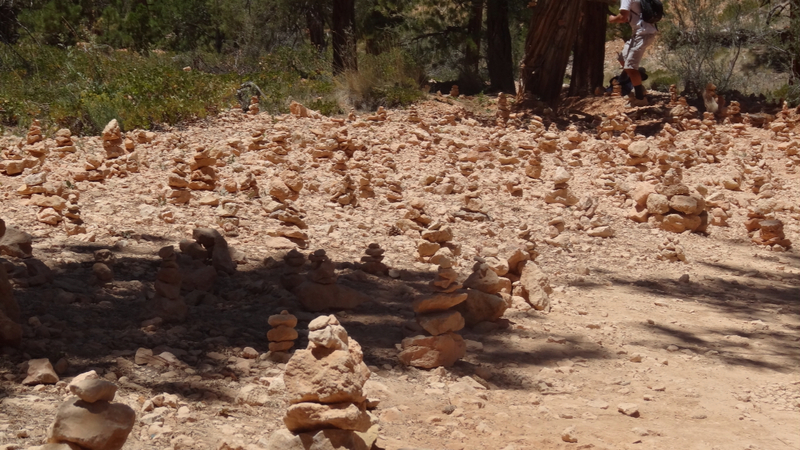 At one point along the trail, there were thousands of cairns. We hiked at the base of the fins. 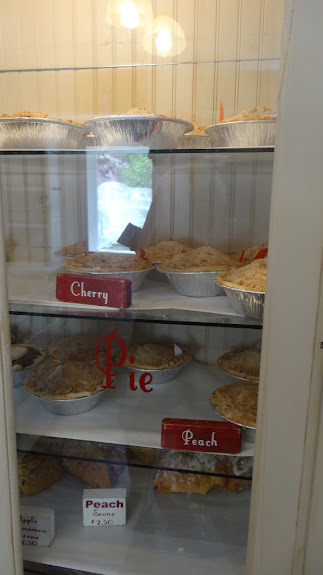 and at eye level with some of the tops. We took several other hikes including the Mossy Cave hike which passed thsi waterfall. 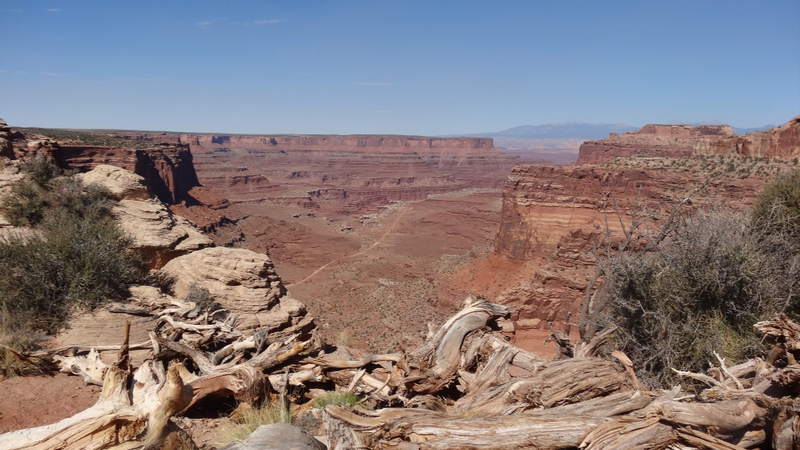 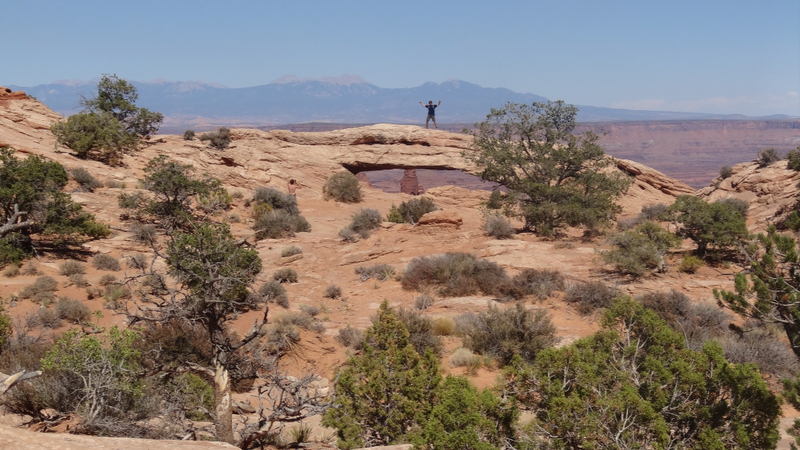 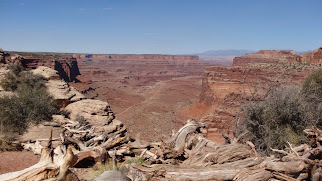 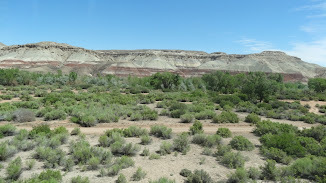 We also visited the nearby Canyonlands National Park. Its a landscape of mesas, fins, arches & spires. We hiked in the desert heat to Mesa Arch. 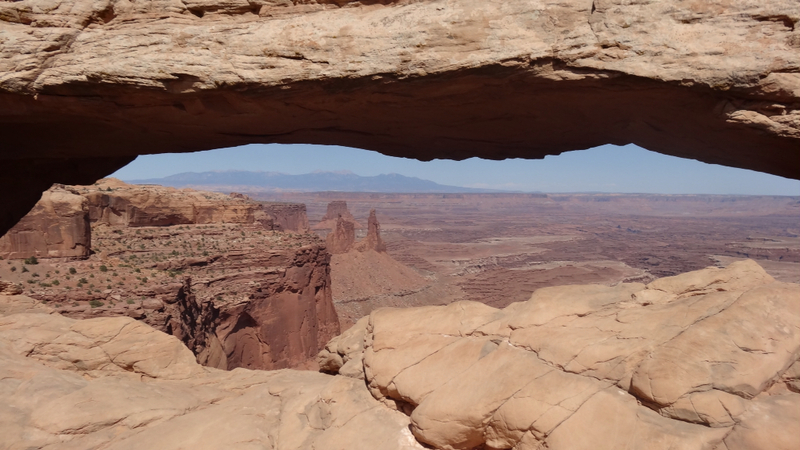 An arch on the edge of a deep canyon. 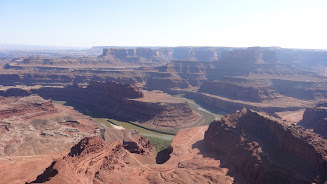 This is nearby Dead Horse Point State Park. Legends says that the point was used as a corral for wild mustangs in the 1800's. 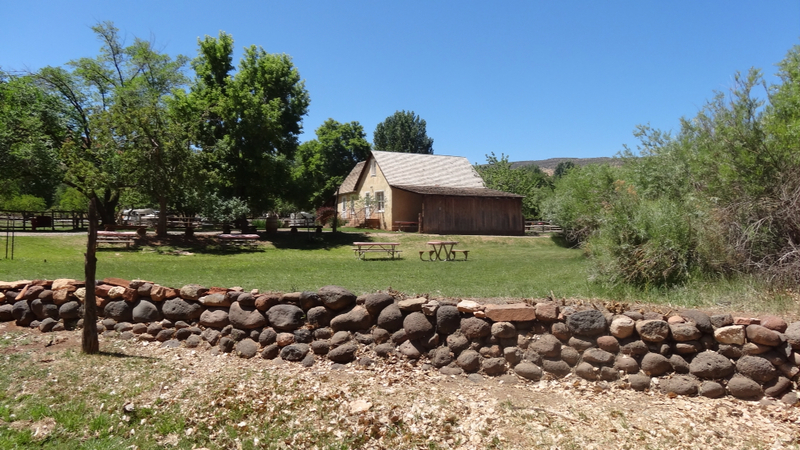 30 yard wide neck of land and fenced the neck with branches & shrubs. 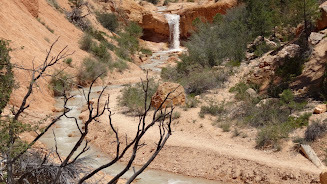 where they died of thrist 2000 feet above the Colorado River.